Chuckles a-plenty at this year's parliamentary press gallery dinner. 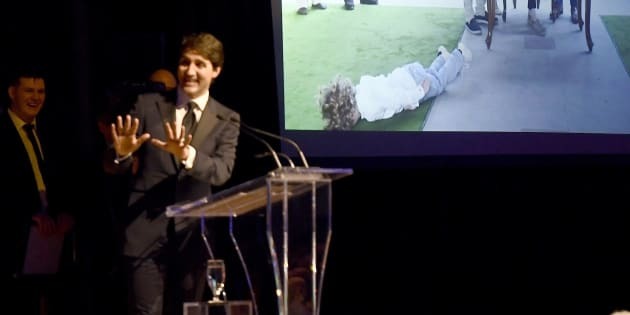 Prime Minister Justin Trudeau shows a slideshow of his trip to India as he jokes during his speech at the Parliamentary Press Gallery dinner in Gatineau, Que. on May 26, 2018. OTTAWA — Federal party leaders got a few digs in at one another and at themselves at the parliamentary press gallery dinner Saturday night. Prime Minister Justin Trudeau's infamous trip to India earlier this year was the focus of many of the jabs — and Trudeau himself addressed the issue by showing a slideshow of the trip and joking that he never wanted to take another trip again. NDP Leader Jagmeet Singh poked fun at the prime minister for his attempt at an Indian bhangra dance while on the trip, then proceeded to lead an instruction of the proper way to perform the dance. But Trudeau wasn't the only one on the receiving end of jokes. Resurrecting his milk-carton joke from last year's press gallery dinner, Conservative Leader Andrew Scheer brought a milk jug onstage with a photo of Singh and the word "missing'' on it, referring to criticism Singh has faced for not spending enough time in Ottawa. Several joking references were also made about Scheer and Singh being lesser known to the public. Ending his remarks on a serious note, Trudeau thanked the journalists for their work, stressing the importance of an independent news media that holds governments to account.